We begin our day at the breakfast table, surrounded by views of the outside world. We find rest in the living room, where we reflect at the end of the day in comfort and safety. These ordinary places can be just as holy as the grandest sacred cathedrals. It is in these spaces that we can deepen our awareness of the holiness that lives here. DAWN: Blinds are raised revealing the morning light, reflecting God’s glory. In this place of quiet solitude we anticipate new beginnings. We make our plans, holding them lightly, letting God guide our daily path. Thank you, O Lord, for your gifts of mercy and faithfulness that are new each morning. AFTERNOON: The laundry basket sits on the kitchen floor, a reminder that we all need rhythms of work and rest. Ordinary tasks have meaning, yet it is important to rest from our work in order to enter into communion with God. O Lord, let us glorify you in all the tasks you have given us and honor our seasons of rest and work. NOON: The hearth and center is the kitchen where we prepare and eat our daily bread. Warmed by the heat of the stove and filled with the aroma of spices and fresh bread, we open our hands and hearts for a community of neighbors and friends. Thank you, O Lord, for the opportunity to serve with the bounty you have given to us. TWILIGHT: As waning light streams through bathroom windows, we come alone and exposed. Bathing in this sanctuary of warm water and soap, we confess and are purified with The Living Water, source of refreshment and restoration. O Lord, we are thankful for this gift of running water, reminder of the Holy Sacrament of Baptism. NIGHTFALL: Just as our furry companions rest cozily between patterned pillows unaware of outside perils, so we can take refuge in the comfort of our living room. In this haven of safety, surrounded by beloved treasures offering memories of travel and friendship, we reflect at days’ end. Thank you, O Lord for your loving arms that hold us, providing protection and peace in the midst of turmoil. 1. 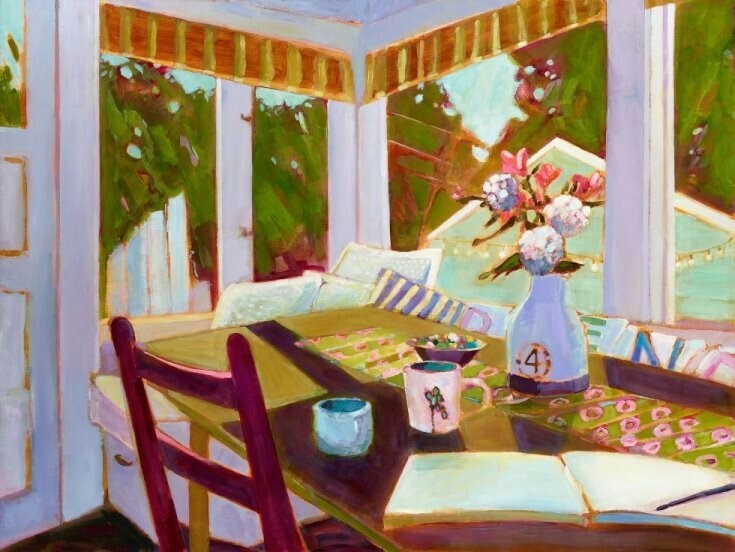 Breakfast Nook, Acrylic on Panel, 36” x 48”. 2. Looking Through, Acrylic on Panel, 10” x 10”. 3. 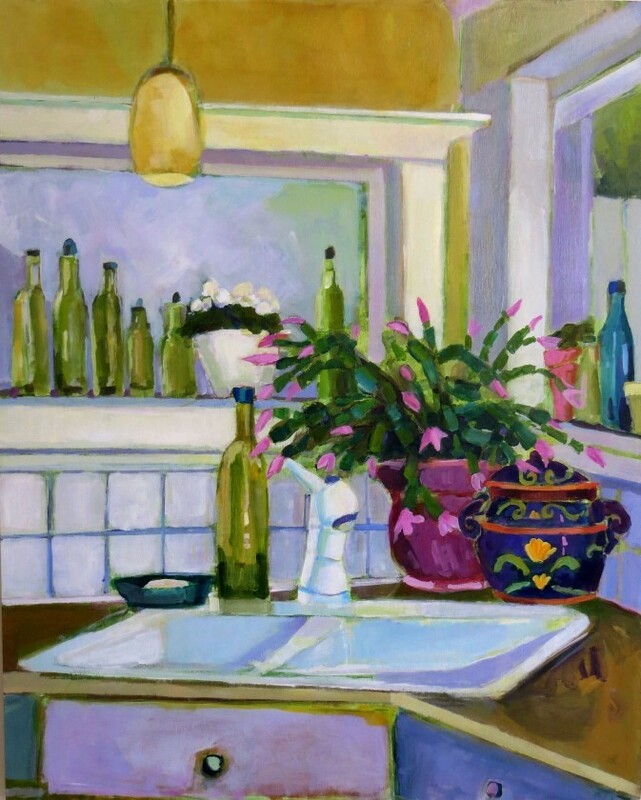 Kitchen Blooms, Acrylic on Panel, 30” x 24”. 4. 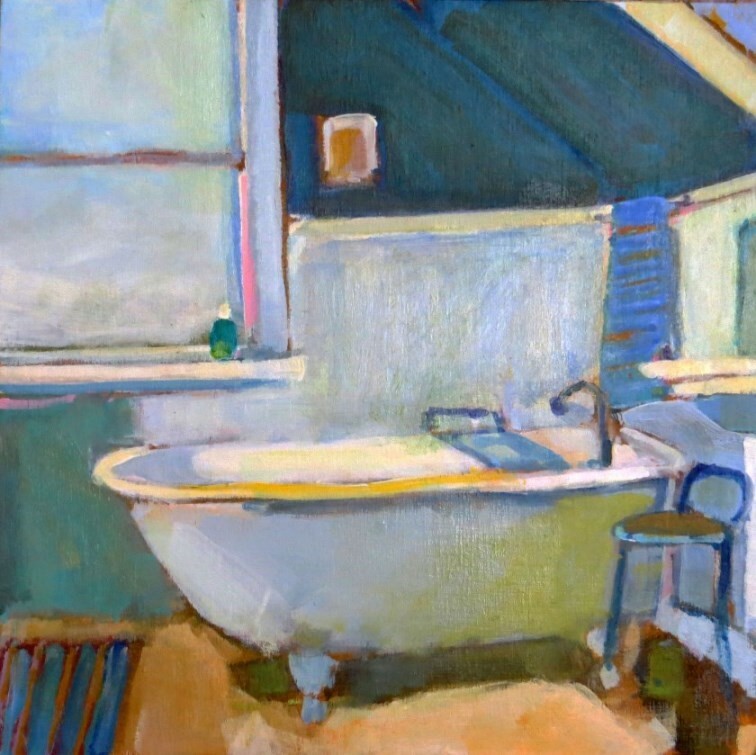 Claw Foot Tub, Acrylic on Panel, 8” x 8”. 5. Nestled, Acrylic on Panel, 24” x 30”. Lisa Snow Lady is a painter living in Seattle, Washington, USA. 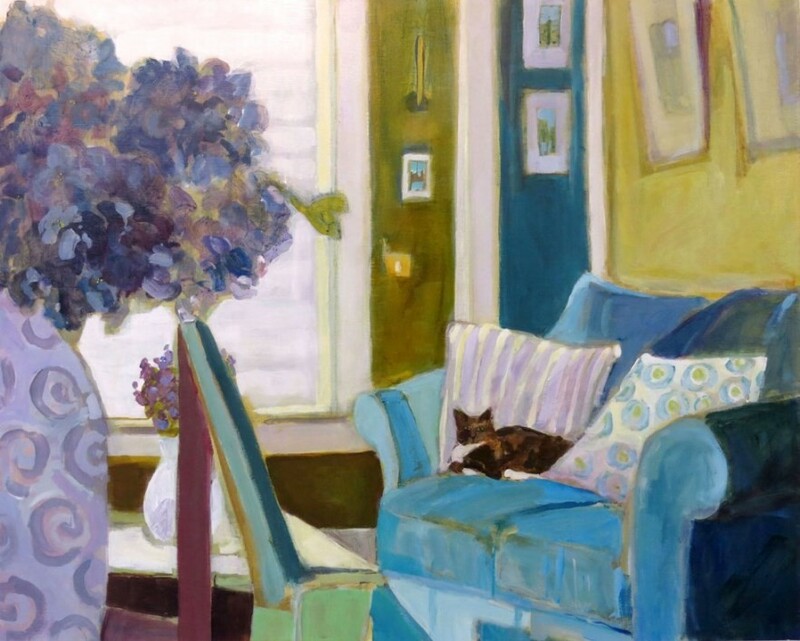 She has a BA in Art History and a BFA in painting from the University of Washington. An extended stay at L’Abri in the Netherlands led her to see everyday living as a creative, sacred act. 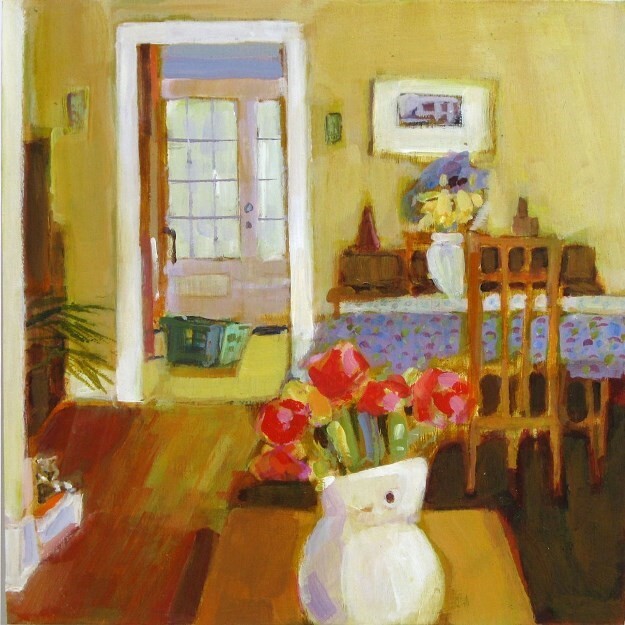 Interiors, gardens, the urban landscape, and the play of light and shadow on structures are common themes in her work. With simple shapes and a limited palette of acrylic paint she captures the beauty found in the ordinary places and objects that often get passed by each day. Among Snow Lady’s influences are 17th-century Dutch artist Johannes Vermeer for his genre subjects, Richard Diebenkorn and the Bay Area Abstract Expressionists bridging the abstract and representational, and the writings of Madeline L’Engle on making the ordinary sacred. Snow Lady has exhibited widely and has won numerous awards and distinctions for her works. She is represented by Harris Harvey in Seattle, WA, USA. For more information visit her website at www.lisasnowlady.com.